Washington trade tariffs against Beijing appear to be backfiring on the US coal industry, as Chinese importers are finding new domestic alternatives to soften the blow. “We have completely stopped US metallurgical coal (imports), which is popular among steel mills, in late July. There is too much uncertainty in trade,” a senior manager at a major Chinese coal trading house told Reuters on condition of anonymity. Starting Thursday, the US is enforcing a new round of tariffs on $ 16 billion of Chinese imports. Beijing is responding with a similar amount, including levies on US metals and coal. Coal is an especially important industry for US President Donald Trump, who wants to revive the industry in the country. 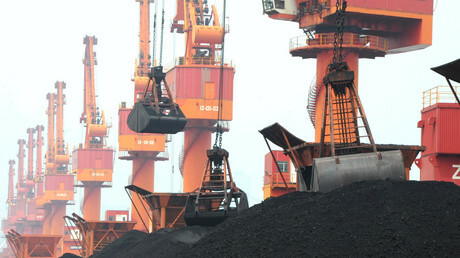 The trading house, Shanghai Runhei, will boost purchase of domestic coal to meet demand from clients, the manager said. “Traders have anticipated yuan depreciation and shored up imports in advance, including cargoes from the United States,” Wang Fei, coal analyst at Huaan Futures told Reuters. Imports of US coal are hardly crucial for the Chinese industry, the analyst notes. US coal exports have been booming during Trump’s presidency. The US Energy Information Administration data says exports increased by 61 percent in 2017 as exports to Asia more than doubled. India, the largest importer of steam coal from the US, tripled its imports last year, mainly used for growing electricity capacity in the country.